The Liberty County ARES Net is now part of the Shark Club net every Thursday night at 7:30pm C.D.T. We are in the initial stages of starting a ARES group to assist Liberty County with emergency commmunications. The group is open to all licensed operators who would like to be a part of the emergency response team. Anyone with a ham radio license is encourged to check in on the net. We would like to let everyone know that the 8:00 Liberty County ARES NET will be discontinued after May 3rd and will become part of the 7:30 Shark Club net. This is (your call sign phonetically), and my name is ( ???????). 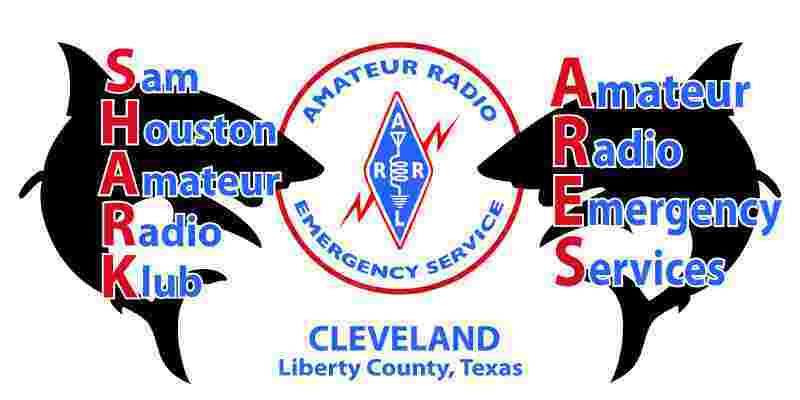 I will be the net control for the Sam Houston Amateur Radio Klub ARES net this evening. This is a directed net and all communications should be directed through net control. Do I have a volunteer to be the backup Net Control this evening? The purpose of this net is to provide training to ARES members and to exchange information regarding ARES activities and requirements, for both public service and emergency preparedness. Although our area of responsibility is primarily Liberty County, this net welcomes and encourages check-ins from outside the county. You do not have to be an ARES or a Shark club member to check into the net. I will now stand by for any EMERGENCY or PRIORITY traffic. Any emergency or priority traffic please call now. Check-ins will be called from the SHARK ARES Roster using the members call sign. Please acknowledge when called by giving your full call sign in ITU phonetics. Indicate at the time if you have traffic or comments for the net. Also we ask you to please give your local weather conditions and area where you are located. Once you have been acknowledged, please stand by until the roster and check- ins have been completed. This is (call sign phonetically), Net Control. I will now call the Liberty County ARES roster. (Recognize those who have checked in by reading back their entire call using ITU phonetics. Net control will now accept check-ins from any other stations wishing to check in. Please Give your call sign slowly in ITU phonetics, as well as your Name, location, local weather conditions, and state whether you have traffic for the net. Anyone wishing to check in to the SHARK ARES net Please call now. This is (call sign) Net Control station for the SHARK ARES net. The following Stations have indicated they have traffic or training for the net. (their call), please Pass your traffic. Are there any comments on this traffic? Please call Net Control. This is (your call sign), Net Control Station. Are there any questions or comments Regarding the training, please call Net Control. With your call sign in ITU phonetics. Acknowledge check-ins and request name and location and if they would like to join us in the future. This is (your call sign). The Liberty County ARES NET will be discontinued as of May 3rd and will be part of the 7:30 Shark Club net. 2. As in all areas of emergency, first priority is for the safety of immediate family. a. 146.900 repeater, - offset, No Tone. f. The net will remain active as long as the emergency exists.